Darjeeling, a home to some of the oldest and renowned boarding schools in the country, is facing an indefinite shutdown over the demand of a separate Gorkhaland. The school authorities are at their wits’ end as to how to send the students home once the vacation starts next week. “Because of the ‘bandh’ we could not go earlier, but now they have given us a safe passage and relaxation. It is our scheduled holiday starting from today and therefore we had requested them. We have been told that we will be lead through a safe roadway and as there are children with us, there will be no harm,” Partha Pratim Dey, Principal of Queen’s Hill School told ANI. He added that on July 4 the school will reopen. “I hope by that time things will be fine,” he added. “I am happy because I am going home and we all are going together. It’s different this time as every time we used to go in private cars,” said Tenzing Chumo, a Class 5 student. Yu Jong, from Korea who is a Class 8 student said that she hopes by the time they come back things will be alright. “I am feeling very good and excited that we are going home after so long,” she said. The Gorkha Janmukti Morcha (GJM) offered a 12-hour “window” on June 23 to the schools in the Darjeeling hills to evacuate their students safely to Siliguri and Rongpo. An indefinite bandh was called in the hills by GJM on June 15. 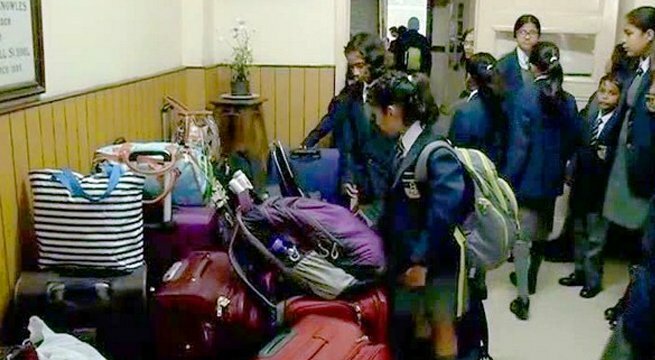 With supplies running out and the vacations to start shortly, the boarding schools of Darjeeling are facing a harrowing time due to the shutdown. The indefinite shutdown has also hit hard the famed tea industry with the premium quality ‘second flush’ tea leaves going waste causing heavy losses to the garden owners and putting at stake the livelihood of more than two lakh tea workers. Darjeeling is home to 87 tea gardens and the ongoing shutdown has pushed them to the brink. The tea garden owners feel that they will be losing 45 per cent of their yearly revenue.